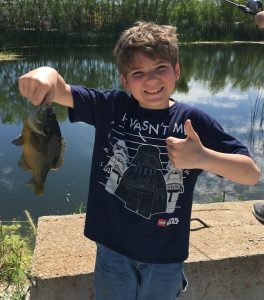 Well, the smiling face of a kid with his catch pretty much says it all. But I’m going to say some more anyway. I usually do. Not only a smile in this photo of my boy, Jayce, but also a triumphant thumbs up on a job well done. All from a stout green sunfish which for pretty much all anglers does not rank particularly high on the gamefish roster. But that’s just right when introducing young anglers to the hobby. No need to be species specific. Target whatever you can get to bite with the most high percentage bait you’ve got. In the case of this local pothole of a pond that meant waxworms on a jighead hung from a slip bobber. Jayce came, Jayce cast, Jayce caught. And in the process caught more than just a quality green sunfish. Also caught the fishing bug. Mission accomplished (and got to put those years of Latin class to use for the second time in 2019).